Starting to see a "trend" here??? 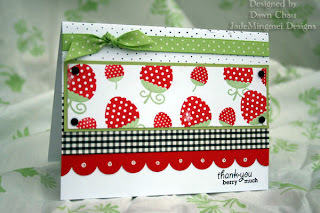 Yup, its more of my beloved Papertrey Ink stamps! They are soo yummy!! Ok, can you seriously say "yummy" when it comes to clear rubber stamps?? I suppose only another enthusiast would agree with me...lol Anyhoo, I have alot of these images already stamped out and when I can squeeze in some time, I run over and put it together. I was dying to break in the strawberries. They reminded me of the strawberries we picked a few weekends ago:) And its a sure bet I will tend to use more summer-like images with the weather finally getting warm here in NY! I love it! They are all so so good!